Patriots defensive end Trey Flowers relies on his work ethic to succeed in the NFL. 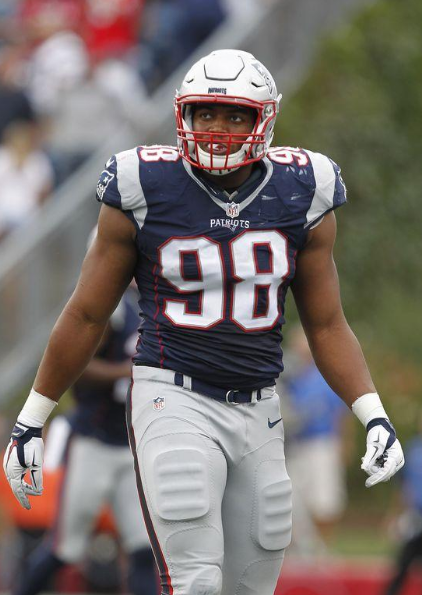 FOXBORO - A year ago at this time, Trey Flowers was on injured reserve. Now, he's on the opposing team's radar. "He's been doing an outstanding job," New York Jets head coach Todd Bowles said of the Patriots' second-year defensive lineman. "I think (defensive coordinator Matt Patricia) has been putting those guys in great position and they have a great understanding of the game and those guys just end up playing fast and making plays. I think he's doing a great job." Teammate Chris Long seconds the motion. "He's one of the elite inside rushers in the league and the fact that he can play outside as well gives him great versatility and value and he's a hard worker and a great teammate," the veteran defensive end said Wednesday. "He's got a lot of unique skills that make him what he is." After participating in just four snaps as a rookie (battling knee and shoulder injuries, he was finally placed on injured reserve on Dec. 1 of last year) and failing to make much of an impact through the first seven games of this season, Flowers, a fourth-round pick out of Arkansas in the 2015 NFL Draft, has broken out of late. Flowers will enter Saturday's game with the Jets at Gillette Stadium having registered a team-leading seven sacks, all in the last seven games, with two in a game on three occasions. On the year, he has 35 tackles (ninth on the Patriots), a team-leading 10 quarterback hits, two fumble recoveries (also tops on the team) and one pass defensed. But Flowers' value, Patriots head coach Bill Belichick says, extends beyond the numbers he may post on his own stat line. "He's been very productive for us in there, has caused a lot of pressures, and his penetration in the middle of the pocket a lot of times opens things up for one of the other defensive tackles or defensive ends that wrap around into the space that he has created with that penetration," said Belichick. "So it's not just the plays that he makes, but he creates some for his teammates, too." That's exactly what transpired last Sunday in Denver. Not only did Flowers get to Trevor Siemian twice, he forced the Broncos quarterback into the arms of Malcom Brown once during the Patriots' 16-3 win. An end by trade, the move to the inside has been a bit of a transition for him. "I worked a little bit (inside) just on pass-rushing downs (in college)," he said. "Guys are going to be bigger, but you have to use your speed to your advantage - my speed and my quickness," the 6-foot-2, 265-pounder said. "A lot of times on the inside you don't have a lot of space, so you might have to maneuver around one or two guys at a time. (It's a matter of) just being able to do that, using my quickness, and knowing that even though I beat one guy I might have to beat another one." The way teammate Rob Ninkovich sees it, what's unfolded during this season has been a story of promise fulfilled. "Trey's a really good football player," the veteran linebacker-defensive end said. "He works really hard at his technique, and he has a great attitude. "His first year, last year, I remember saying to myself that this kid's going to be a really good football player. So I'm happy to have played with him and to see his progress and see him grow as a player. This is just the beginning for him. He's got a long way to go." That's another motion Long seconds. "You see it," said Long. "He's already very good and he can always continue to get better. He's very young and he works hard." His work ethic, Flowers said, was instilled in him at an early age. "As a child, I was instilled in that just with my father (Robert) being on a construction site and things like that. Just knowing that you've got to work hard to get what you want," said Flowers. "So I've always been a hard worker. I've got a lot of brothers and sisters that push each other to work hard, so it just came in the blood."